These colouring pages are just for fun – perfect to send home with the kids in the evening, perhaps, or to mark your first time-telling lessons. Here's a simple colour of a rather lovely, stately clock. Why not use it when the kids are learning to tell the time? Colour in a picture of a little boy looking at a grandfather clock. 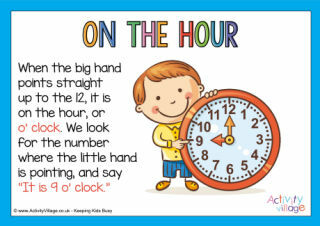 You could use this to accompany "My Grandfather's Clock" or perhaps when learning about telling the time. Celebrate learning to tell the time - or at least starting the process, with this colouring page featuring a lovely grandfather clock. Celebrate the beginning of a new year with this lovely colouring page featuring a grand clock striking midnight! Learning to tell the time can be fun - and who says it shouldn't involve a little colouring in, too! This colouring page was requested by one of our Members as she starts to teach her child how to tell the time.